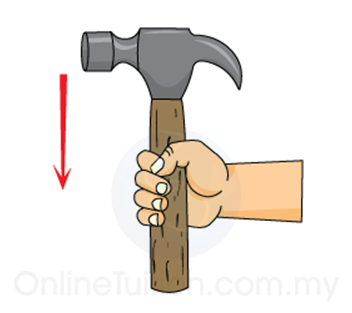 When the handle of the hammer hit on the surface, the handle stop but the head of the hammer keep on moving downward, owing to the effect of inertia. As a result, hammer head will fit tighter into the hammer. 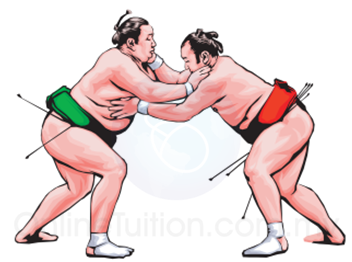 Japanese sumo wrestlers normally have great body mass. This is because the greater mass can increases the effect of inertia and hence more difficult to be moved by their opponents. When a prey trying to run off from its predator, it will run in zig zag rather than a straight path. A predator usually has greater mass and hence greater effect of inertia. It is more difficult for the predator to change direction compare to the prey. Animals shake their body to dry their fur. 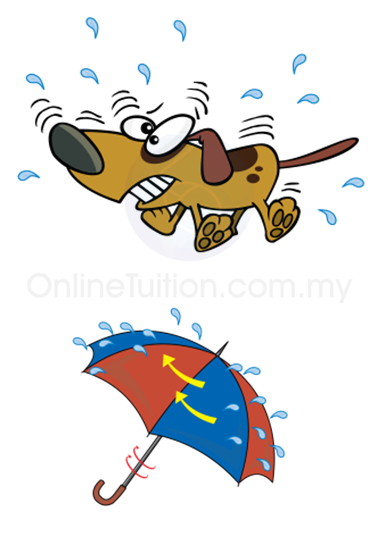 We can spin an umbrella to remove water on the umbrella. When the direction (of the fur/ umbrella) change, the water droplets keep on moving forward due to the effect of inertia, and hence leave the fur of the animals/umbrella. The tank in a tanker lorry is divided into smaller tanks. This may reduce the motion of the liquid inside the tank and hence reduces the effect of inertia. The passengers in a car will be thrown forward when the car stop suddenly due to the effect of inertia. The seat belt and airbag can reduce the impulsive force acted on the body of the passenger and hence prevent serious injury.